To become a better bass fisherman there’s no substitute for time on the water, except for Robert Montgomery’s new book Kickin’ Bass. Writing for Bassmasters Magazine, Montgomery has covered bass fishing for several decades. 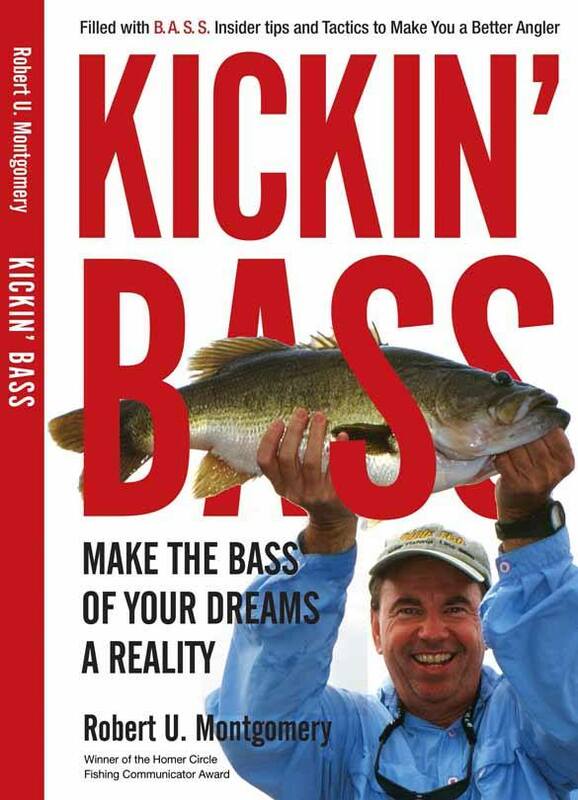 He’s written many books offering tips for catching bass. His recent offering boasts to make the bass of your dreams a reality. Kickin’ Bass divulges strategies and techniques, bass biology and behavior, fisheries management and stewardship, locations, and finally tacklebox contents. The book relies on bass fishing experts, covering the sport top to bottom, shallow to deep, on knowing how, where and when to catch them. Montgomery’s inclusion of guides is thoughtful. They can catch fish, but their real job is to break down the details involved to enable clients to achieve success. Books relying on pro anglers assume the reader is at that level and that the pro is able to get the points across. Pro fishing skills often don’t go much beyond magazine copy points. Montgomery references pro anglers to eliminate water and unproductive fishing spots and situations. Conservation, and its impact, is discussed with the most respected black bass fisheries biologist, Gene Gilliland. He says if a bass is caught in an area, fish it longer. The fish was there for a reason and others will be there for that reason. He also says there are a lot more fish in a spot than we could imagine. Electro fishing reveals a lot about fish population density, but also how they move and other details about their diet, memory and habitat. Predictable behavior is important to thinking your way to making the right decision on lures and fishing spots. It pays to have a great relationship with fisheries managers. After all their jobs depend on angling success. Additionally, fish care is discussed. Of course, a fishing book titled Kickin’ Bass must reveal secret lures. Not just the new stuff, but the classics as well. Anglers agree there’s nothing as exciting as seeing a bass explode on a surface lure. The topwater fishing section picks the brain of a legendary lure maker, debunks a few topwater myths such as when to use them, but also reveals finer points including presentation, lure selection, and gear that works best. If you get excited about topwater fishing, this section alone is worth the price of the book. Lots of useful and interesting fishing information cover to cover doesn’t wind down. Hookset advice on every type of lure from the best bass fishing pro on the planet, Kevin VanDam will make anyone a more productive angler. And what fishing compilation would be complete without a Top Ten Tips for Being a Better Angler…everything from casting practice, to understanding weather to paying attention to the surroundings. These tips are gold. Montgomery’s latest book is also a fishing troubleshooting guide. One thing for sure, just when you have bass figured out, something changes. High water encourages bass to move into new shallow cover. Advice on how to approach these fish is revealed. Vertical cover, like sea walls, bluffs and docks are prime targets. But when it comes to lures, there are a variety that produce and they are featured in this segment. Understanding submerged grasses can help find more bass. Grass isn’t just grass. Knowing the difference, how they grow, and where they grow can put more fish in the boat. Virginia Pro John Crews prefers milfoil as he uses punching techniques and targets edges with jigs and soft plastics. An interesting chapter investigates how to choose the best fishing guide. Word of mouth is a good start, but being compatible with the guide is also very important. After all, you’ll be spending 8 hours a few feet away from the guide all day. A teaching guide, who encourages rather than criticizes, is going to be easier to get along with. Read what others say on the internet. Sponsors show they’ve been vetted by fishing companies. Guides who hate their jobs are guaranteed to deliver a miserable day. Guides who fish tournaments may not have the best interest of the client in mind. Hard to be good at both. It’s very important to know your guide is commercially insured, just in case! Over 63 million Americans fish. About half fish for largemouth bass. They’re in nearly every state, live in shallow water, are aggressive, and put up a good fight. Sport fishing for largemouth bass has been around since the late 1960s. The ways to fish for them and the number of lures have constantly evolved. Attorneys say there are more patents on fishing lures than even medical devices! Kickin’ Bass, on Amazon, fills in experience gaps to reveal the right lure at the right time in the right place for the bass of a lifetime. Also try soft plastics around any cover, including grass remnants. Use 4 inch green pumpkin Mizmo tubes on 3/0 Mustad Mega Bite hooks with 12 pound test Edge fluorocarbon line. A 3/16-ounce bullet weight will be enough under most conditions. Also a soaking in garlic flavor Jack’s Juice Bait Spray will encourage fish to hold on longer. Get out the spinning gear and spool with either 15 or 20-pound test Gamma Torque braid. Tie a 10-pound Edge leader and rig Mizmo grubs, Mizmo tubes with insert heads, split shot and drop shot rigs. For the drop shot and split shot rigs, use a 2/0 Mustad Mega Bite hook. Quantum Smoke spinning reels are perfect for these light line presentations.